Right after I finished the latest dog subscription box comparison post I got the opportunity to try another new one for us. Since we’re basically experts now, Pooch Perks wanted us to check out their box and let everyone know what we thought. Pooch Perks definitely got off on the right foot with us. 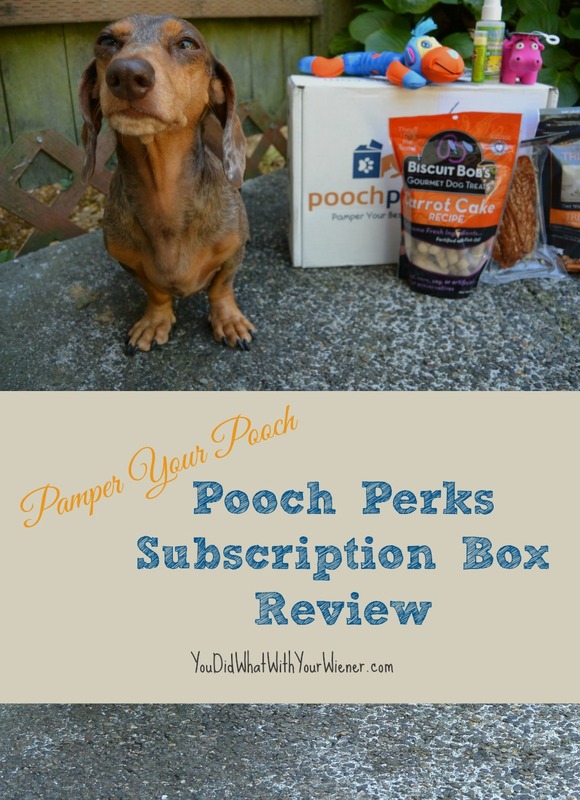 Two things really caught my attention about the Pooch Perks subscription box. First, their toys are held to the same rigorous standards and children’s toys. What does that mean exactly? Toy safety is the practice of ensuring that toys, especially those made for children, are safe, usually through the application of set safety standards (Wikipedia). I tried to look up what it meant in more detail but all I found was a bunch of legal mumbo-jumbo. I can assure you it’s a good thing though. Second, preference is given to small batch gourmet, socially aware, treat companies. If you know us, you know that we love to support local and are picky about the quality of our treats. Pooch Perks was started by two Dog Mom’s who are obsessed with their four legged children and love to spoil them. They created the subscription box company to provide carefully curated good-for-pooch treats and toys so you can pamper your pooch without sacrificing convenience. Each Pooch Perks box is full of fun toys, healthy Made in the USA treats, and other exciting goodies. They ship full size toys and treats to give you the most value for your money but also include several small samples so your dog gets to try more than just two or three new things a month. The focus is on treats that are predominately organic, grain free, and with no added preservatives, fillers, or artificial colors. With prices ranging from $20 for 2 to 3 items to $50 for 6 items, and shipping included in every package price, there is a box to fit every budget. They also ship treats-only boxes for $20. You are given two size options at checkout – under 35 lbs and over 35 lbs – to help tailor the box to your dog’s needs and preferences. A portion of every Pooch Perks subscription is donated to organizations that rescue abused and neglected dogs. Between the two founders, they own 8 rescue dogs that were abused, abandoned, or neglected. They believe Rescue is a breed and encourage people to rescue the hundreds of thousands of dogs that reside in shelters across the U.S.
You can learn more about Pooch Perks on their Facebook page. Our box contained 3 full-sized treats, 7 treat samples, 3 toys, a mini bottle of pet stain remover, and a small nose balm for dogs. 1) Snif-Snax Salmon Fillet Treats – These treats contain only premium-grade salmon rich in Omega 3 oils. Besides a touch of salt and hickory smoke flavoring, there is nothing added. 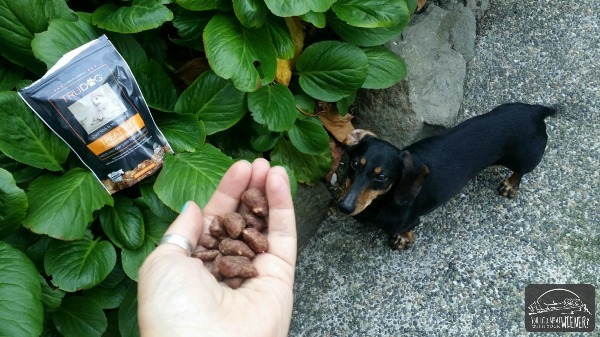 2) TruDog Treat Me Crunchy Beef Delights – These freeze dried treats contain only high-quality, free ranging, grass fed, USDA approved beef, and a natural omega blend. The crunchy treats are comprised of beef, whole organ meats, and meaty bones. The freeze drying process preserves the natural and freshness of the beef. 3) Biscuit Bob’s Carrot Cake Gourmet Dog Treats – Biscuit Bob’s is a family-owned company. They use and promote locally grown foods and source additional ingredients from U.S. companies. These crunchy carrot cake flavored bones are primarily made with oats, rye, carrots, and millet. 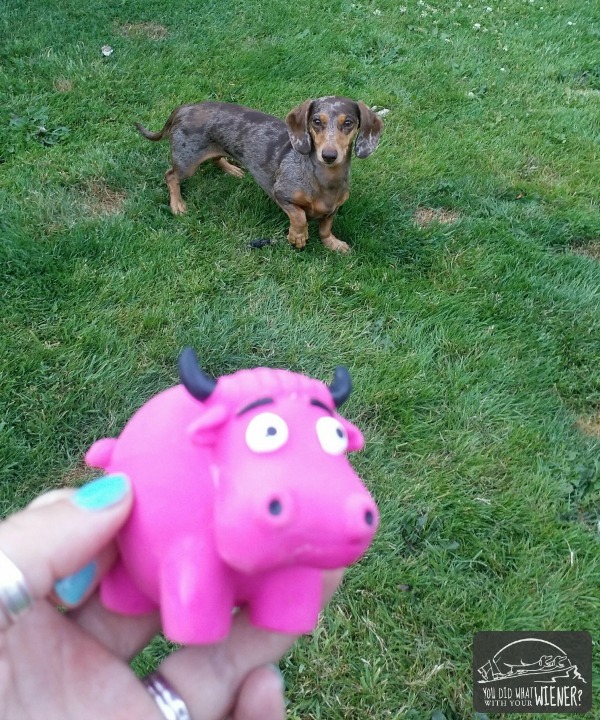 4) Krislin Cow Mini Ball Dog Toy – This soft latex, pink cow is safe and hygienic for your pet. The bright color, bounciness, and high-pitched squeak is sure to keep your dog entertained. 5) Chomper Junior Tail Wagger Bone with Plush Tail – This dog toy is very durable and great for playing tug or fetch with your dog. It’s made of made of top quality ballistic nylon and a rubbery plastic (I couldn’t find exactly what the material is). 6) Petstages Mini Barbell Chew Toy – This durable little barbell is made for dogs with a strong desire to chew. It has multiple textures on the rubber part to to massage gums when chewed and rope and canvas streamers help remove soft tartar. 7) Absolutely Clean Pet Stain and Odor Remover – This eco-friendly, natural enzyme stain and odor remover doesn’t contain toxic chemicals and has a fresh, pleasant scent. 8) Snoutstik Rosemary Nose Balm for Dogs – Snoutstik helps alleviate dry dog noses caused by exposure to the elements, allergies, heredity, and other conditions. The main formula includes a combination of healing, natural sunscreens, Shea Butter, Sweet Almond Oil, and Jojoba Seed Oil. It comes in rosemary, lavender and pumpkin which all treat different conditions. We received the rosemary, which is a natural disinfectant; soothes and reduces inflammation; and treats bacterial and fungal infections. Samples: Samples included three different types of Zuke’s treats, 2 types of treats from Lindy & Company, and one each from MoJo’s Morsels and Biscuit Bob’s. This was the first time we received a subscription box and Gretel literally tried to tear through the cardboard to get inside. That really surprised me. I also liked that the box contained so many different products. There were a few things that were big hits with Chester and Gretel. They both loved the pink squeakie cow. They took turns stealing it from each other. I am pleasantly surprised that neither of them have tore it up yet (they’ve only been playing with it for two days though so we shall she how long it lasts). The TruDog and Snif-Snax treats were a hit too. Both were all meat so how could they not have been? I could smell the smokey salmon fillets through the vacuum sealed package so I bet that is why Gretel was trying to tear the box apart. Overall, I gave this box a high-average rating for the number of items included, the quality of the items, and the company’s preference for supporting the little guy. Disclosure: This post is sponsored by Pooch Perks. I received compensation in exchange for my honest review. YouDidWhatWithYourweiner only writes about products that we would use and everything we say is really how we feel. Pooch Perks is not responsible for the content of this article. Those are some great goodies Chester and Gretel got 🙂 These boxes are so cool!! Wow oh wow! This box looks fun! I have 3 pups that could have a blast checking it out! look at all of those toys, my 3 gals would love this. Wow, the quality of this box really sounds great! I love the values this company has. 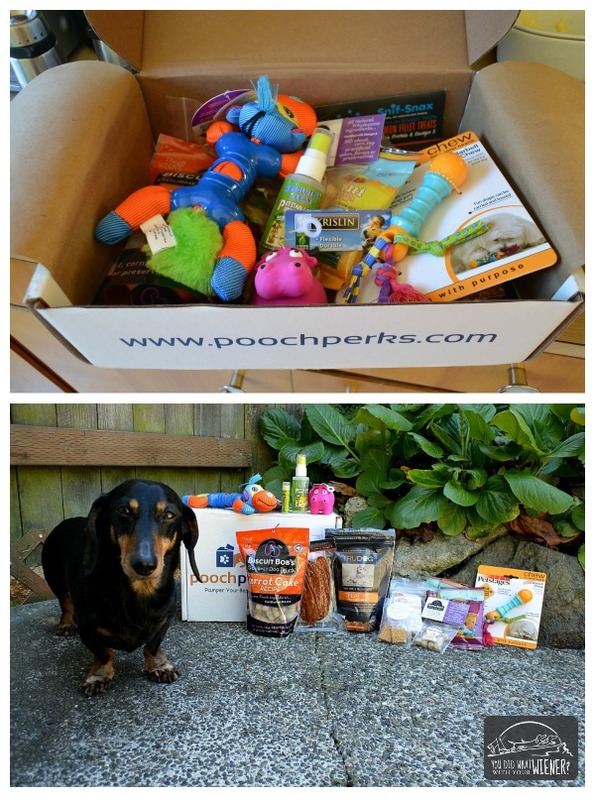 These Pooch Perk Dog Boxes sounds great! I also love that they donate some of the proceeds to organizations that rescue abused and neglected dogs. I may need to give this a try for my girls. I think we’d actually use 2/3 of this box! Mr. N is a picky pup so subscription boxes normally don’t make much sense because he wouldn’t eat or play with half the things. This looks like a great box subscription! I also love the variety that came in the box. The bone with tail toy I can see Sophie loving. I’m definitely entering! Thx! You guys are definitely the subscription box gurus! 🙂 This looks like a great box! Nike says she sure would like to win! I try. Really. But just when I think I have seen them all, 5 more pop up. Ha, ha. Thanks for the giveaway! It would be really cool to win. Take care! That’s a whole lotta stuff! What a great company! Thanks for sharing this with us. I love your subscription box updates. How do you enter to win? I would love to win a box for my dogs. They love treats and toys. I liked that there is a variety in each box. Hi Daniel. I am glad you like the box. Unfortunately this giveaway has ended. There may be another one next month. Just curious – did you come over from Twitter? I edited the post to remove the giveaway stuff after it ended… or so I thought. I looked again and didn’t see anything but perhaps I missed it. If so, please let me know. If you came over from Twitter it would make sense. I am not able to edit what other people share and they may have shared and old like that still had giveaway in the title.